Degree or darkness of roast dramatically affects a coffee’s flavor profile, as does how the coffee has been brought to a given roast: quickly with high temperatures, slowly with low, and so on. Overly light roasts may taste bready, woody or grain-like; overly dark roasts charred and thin. But aside from these extremes, no single degree of roast is necessarily better than another. Preferences in roast vary widely, influenced by tradition, brewing style (coffee intended for drip brewing is often roasted lighter than coffee intended for espresso or French-press brewing) and drinking style (people who take their coffee with milk often prefer darker roasts to lighter.) Today, the best roasters seek to hit what to their palates is the “sweet spot” for a given green coffee, the point at which the structure of the coffee is most balanced and the aroma/flavor most complete and complex. When Coffee Review first began reviewing coffees darker roasts were fashionable, and we very often encountered coffees that tasted scorched, bitterish and thin. Today medium-to-light roasts are fashionable, much to our relief, although we now occasionally cup a sample that is starchy or woody, indicating it is not fully developed in the roast. Degree of roast can be measured with some precision through the use of a specially modified spectrophotometer popularly called an Agtron. We use the M-Basic or “Gourmet” Agtron scale, and for each coffee reviewed we present readings both of the whole beans before grinding (the number preceding the slash) and the same beans after grinding (the number after the slash). For example, a reading of 55/68 would describe a coffee with an external, whole-bean M-Basic reading of 55, and a ground reading of 68. Agtron readings range from the lightest, around 70 whole bean and 95 ground, to 25 whole-bean and 30 ground (very dark; essentially burned, although some coffee drinkers like the style). 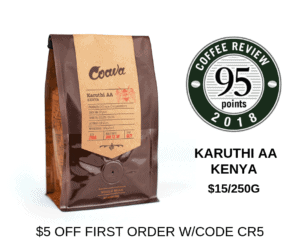 Most coffees we review at Coffee Review come in near the middle of the scale, with the darkest whole-bean around 45 and the lightest around 60. Based on the Agtron readings, we also insert general descriptive terms for roast color – light, medium, medium-dark, dark, etc. – for each coffee reviewed based on terminology developed by the Specialty Coffee Association of America. These deliberately simple terms avoid the glamour of more popular roast terms like French, Viennese, Espresso, Italian and the like, which can be confusing because their use varies so widely. A Starbucks regular roast may be considerably darker than many espresso roasts, for example, while a Viennese roast can mean almost anything depending on who is doing the roasting and labeling. The following chart can be used as a general guide to describe different roast levels. The number we use in assigning names for roast levels reflects an average of the two values indicated for each coffee, whole-bean and ground. Thus a coffee with a whole-bean reading of 50 and a ground reading of 60 would land at 55 (“Medium”) in the chart below and consequently would be described as “Medium” in our review.